A shipload of gravel is causing controversy in French Polynesia amid campaigners' concerns that it could be contaminated with plutonium from nuclear tests. 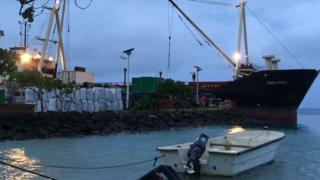 The cargo has been unloaded in the port town of Rikitea, on Mangareva island, against the wishes of island leaders, Radio New Zealand reports. It has been transported 800km (500 miles) from Hao atoll, used as a military base by France when it carried out nuclear weapons tests in the Pacific, and anti-nuclear group Association 193 claims it is irradiated. The stone will be used to build roads on the island as it develops fish farms to supply the Chinese market. The French Polynesian government has moved to allay the islanders' fears, saying that the gravel comes from ground-down accommodation buildings and hangars which formed the French military base on Hao. According to Public Works Minister Albert Solia, three separate tests carried out since 2009 show that there is no contamination, and there'll be further tests on the cargo to prove it is safe for use on Mangareva. However, Association 193 claims the shipment is the first of many, and says French Polynesian President Edouard Fritch "is solely responsible for this conflict situation". Group leader Jerry Gooding says he doesn't have any faith in the guarantees given by the authorities, telling France TV: "For years there have been too many lies. It's always the same." After two decades of winding down operations and decontaminating the atoll, the last French troops only left Hao last week, France TV reports. However, their clean-up work isn't entirely complete, as locals are still concerned about a large quantity of asbestos left behind. France carried out 193 nuclear tests in the Pacific over three decades, until it switched to computer simulations in 1996.